The Comica Festival will unveil Dave Gibbons' giant print satirising Roy Lichtenstein's 'WHAAM!' at Central Saint Martins, King's Cross, London, Saturday 20th April. 'WHAAM!' by Roy Lichtenstein is Pop Art's most famous appropriation of comic book panels. It is currently the toast of London as the star attractions a massive Lichtenstein retrospective at Tate Modern. But what about the unsung, underpaid artist who drew the panel he used? Dave Gibbons, illustrator and co-creator with Alan Moore of Watchmen, has re-appropriated Roy’s original source for his iconic painting 'WHAAM!' and turned the spotlight back onto the brilliant illustrator, Irv Novick, who produced it in the DC war comic book All-American Men of War. Gibbons has used Novick’s original composition to make 'WHAAT? ', his own version of the panel, by removing none of Novick’s original elements. He has also stayed true to the full original script in both caption and balloon, probably written by editor Robert Kanigher, and to the design and placement of letterer Gaspar Saladino’s lettering and sound effects. Gibbons wittily turns WHAAM!’ into ‘WHAAT?’ and the missing onomatopoeia of the missile firing, ‘WHOOSH!’, into the telling question, ‘WHOOSE?’. And all those red dots are actually dollar signs! It’s an appropriate charity, as its proceeds go to help comics professionals who need financial assistance. Gibbons has had this giant print specially made, and will also raise funds by signing a smaller limited edition prints of this image, available shortly. Meanwhile, his controversial large blow-up of 'WHAAT?' goes on show to the public for the first time on Saturday April 20th as part of Comica Festival, a whole day of exhibits, interviews, live-drawing, competitions and a massive independent comics fair, from 11.00am to 7.00pm in The White Lab, at Central Saint Martins, King's Cross, London, admission free. Opening on May the 4th (Star Wars Day) and ending on 25th May (the 30th anniversary of Return of the Jedi), Manchester's award winning Generation Gallery will be hosting an art event with a difference. Generation Gallery will be flying the official Star Wars fine art collection over from America, each piece of art is accompanied by certification from Lucasfilm, original artwork as well as pieces limited to less then 95 worldwide will be on show. “The 14th is also George Lucas’s birthday so the month of May is turning into a Star Wars extravaganza," says Robert Marks, Gallery Manager. "We are the only art gallery in the UK with this collection so we envisage this event being hugely popular." 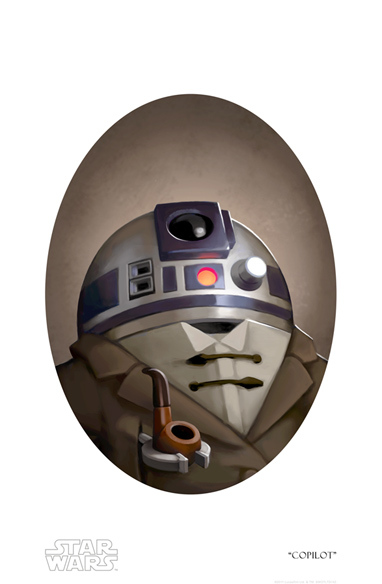 Lucasfilm have worked with some very exciting artists for this collection including one of Hollywood’s most impressive illustrators, Ryan Church. Ryan not only created the concept artwork for the most recent Star Wars films but many of Hollywood’s latest blockbusters including Avatar, Zero Dark Thirty, Transformers, War of the Worlds and more. Fans from all over the country will be attending the invitation-only launch event on the evening of the 3rd May, where they can mix with Darth Vader and a squad of his Stormtroopers while enjoying the artwork. • Generation Gallery, New York Street, Manchester, M1 4BD. Web: www.generationgallery.com. The exhibition is free to attend. Tickets to the opening event are free but fans need to call 0161 247 7870 to be added to the guest list. Bob the Builder magazine, published by Immediate Media, is celebrating its 200th issue with the launch of a national competition to win a visit from Bob the Builder at your child’s nursery or school. Bob the Builder is a four-weekly title pre-school magazine launched in November 2000 and is now published by Immediate Media Company on behalf of rights-owner HIT Entertainment. It has a circulation of 35,027 (ABC circulation figures July-Dec 2012). The magazine is published under licence from BBC Worldwide. Bob will be visiting the three lucky UK schools or nurseries picked at random from online nominations by parents and everyone at the three winning schools or nurseries will receive a free copy of the magazine. To be in with a chance, parents are invited to enter their nursery or school here. 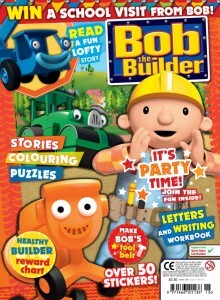 The 200th issue of Bob the Builder magazine is packed with lots of activities to keep little builders busy. Readers can share two fun stories and do some pencil practice in a writing and letters workbook. The magazine comes with a sticker sheet to make a party scene for Bob’s crew and a healthy eating reward chart. Young readers can also make a tool belt just like Bob’s – there’s even a pocket for their free phone and keys that come with the issue. • The 200th issue of Bob the Builder magazine is now on sale in newsagents and supermarkets, priced £2.50. 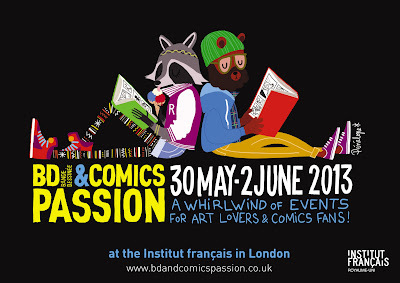 The Institut français, London has announced the line up for its 2013 BD & Comics Passion Festival (30 May - 2 June 2013), which includes appearances by Patrick Sobral, Laurent Verron, Paul Gravett, Posy Simmonds, Etienne Davodeau, Glen Baxter, Ian Culbard, David Zane Mairowitz and Mark Stafford. The rise of the comic book in the past few years has been staggering, and even to the casual observer, unavoidable. With the likes of Nemo and Habibi topping the charts, and comic book artists such as Chris Ware, Bryan Talbot and Neil Gaiman becoming household names, the genre, after being looked down on for so many years, is finally being recognised as a creative powerhouse, and given the consideration it truly deserves. Appearing under different guises – hardback, softback, tall, short, thick, paper, digital – and under different names – comic books, graphic novels, comix, bandes dessinées – comic books are taking over our bookshops, our films, our clothes, our museums... To celebrate this momentum and to explore the many influences of comic books, the Institut français launched a new festival in 2011, the BD & Comics Passion, bringing together legendary creators for innovative events and thrilling discoveries. Previous editions boasted illustrious comic book artists such as Dave Gibbons, Guy Delisle, Bryan Talbot, Bastien Vivès, Kevin O’Neill, Rosinski and Pat Mills. This year's edition will feature extraordinary creators including Posy Simmonds, Edika, Glen Baxter, Etienne Davodeau, Marc-Antoine Mathieu, Régis Loisel, Hunt Emerson, Pénélope Bagieu and more. Once again, the programme will prove “as imaginative as the work itself” (Metro) with groundbreaking events such as Drink & Draw, a one of a kind event mingling live drawing and wine tasting led by renowned British Master of Wine Tim Atkin. Due to popular demand, this edition will feature not one but two Drawing Jams, with French stars La Grande Sophie and GiédRé providing an entrancing soundtrack to the guest illustrators' drawn improvisations. In addition to talks and workshops, the festival will host its trademark event, the Drawing Duo, which encourages a French artist and a British artist to collaborate on a series of drawings before the eyes of the audience – an emblem of the festival in a sense. 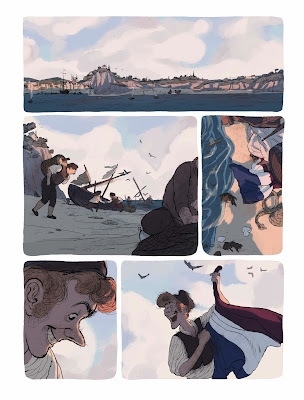 This year, the Drawing Duo is back with two Franco-British collaborations: Posy Simmonds with Etienne Davodeau, and Hunt Emerson with François Boucq. This festival is also an opportunity to explore the links with literature, and show that the genre of comic books is not cut off or quarantined. In previous editions, well-known literary figures such as China Miéville and Audrey Niffenegger talked about their favourite comic books, and this year, Glen Baxter will unveil his literary influences – from Apollinaire to Jarry – while I. N. J. Culbard, David Zane Mairowitz, Mark Stafford discuss the challenges, and ultimately the magic, of turning a literary classic into a graphic novel. Another highlight of this year's edition is a talk with French underground literature legend Virginie Despentes, who will reveal her “graphic greats”. Children will be able to attend workshops to create their own comic book on paper or iPad, masterclasses with celebrated authors to draw their favourite characters, and films for the whole family. All the French guests have had English translations of their works, with four of them coming out during the festival: 3” (Marc-Antoine Mathieu, Jonathan Cape), Apocalypse Baby (Virginie Despentes, Serpent's Tail), Peter (Régis Loisel, Soaring Penguin Press) and The Initiates (Etienne Davodeau, NBM). £12 | See both concerts for only £15! ages 18+ | £7 | See both concerts for only £15! in English & in French | ages 8-11 | £7 | max. 25 children | no grown-ups! in English & in French | ages 12-16 | £15 | max. 10 children | no grown-ups! Talk: Edika - Am Aïe Djoking? Workshop: Get drawing on your Ipad! in English & in French | ages 8-11 | £15 | max. 10 children | no grown-ups! Following the series announcement at last year’s New York Comic Con, US publisher Dark Horse has announced the official release date for Catalyst Comix, whose creative team includes Dan McDaid, Paul Maybury and Brendan McCarthy. The creative team of Joe Casey and artists Dan McDaid, Ulises Farinas, and Paul Maybury will be turning the superhero genre inside out with a completely original take on capes, tights, and superpowers in the series. Man of action Joe Casey reimagines powerhouse Titan, guardian angel Amazing Grace, and the subversive Agents of Change in three mind-blowing, intertwining stories. Superhero comics get a back-alley facelift as these very different champions confront a cosmic threat and personal demons -- and where better to start than the end of the world! One of the most exciting and groundbreaking new series in Dark Horse’s superhero initiative, Catalyst Comix promises an inspired take on the capes-and-tights genre, with wraparound series covers from Rafael Grampá, Paul Pope, and Brendan McCarthy. Look for the first issue in your local comic shop on 3rd July 2013. Here's the info on the latest issues of DC Thomson's last remaining war comic, Commando, on sale now through high street newsagents and available digitally. 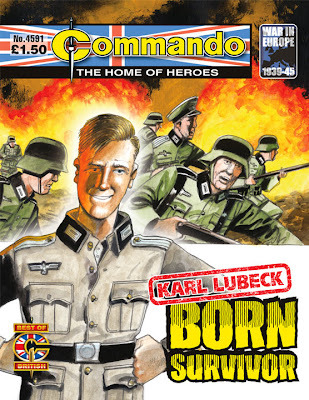 Karl Lubeck joined the German Army more or less by accident. He really wanted to be a civil servant and the Wehrmacht soon found out that he would have been much better suited to bureaucracy than battlefield. It took the considerable efforts of a wily, experienced NCO to turn him into any sort of a commander. And keep his head on his shoulders. Yet Karl would be the man who did what no other German officer managed… and lived to tell the tale. The war on the Ostfront was going badly for the Germans. Soviet forces had stemmed their advance and now the invaders were in retreat. As the withdrawal went on, it threatened to become a rout as desperate men sought to escape. Originally Commando No 97 (December 1963), re-issued as No 583 (September 1971). Sergeant George Lister was a gunner who didn't know much about fancy talk and smart saluting. He was a bit lost when men spoke of tactics, of fast-moving mobile artillery, of the intricate calculation needed to work out long-range bombardments. But when the going got rough and his troop was left alone and on foot to drag a ton of gun up the sheer face of a mountain behind enemy lines - then! - it was Geordie's massive shoulders, raw courage and bull-roar of command that drove every man to sweat blood doing the impossible! 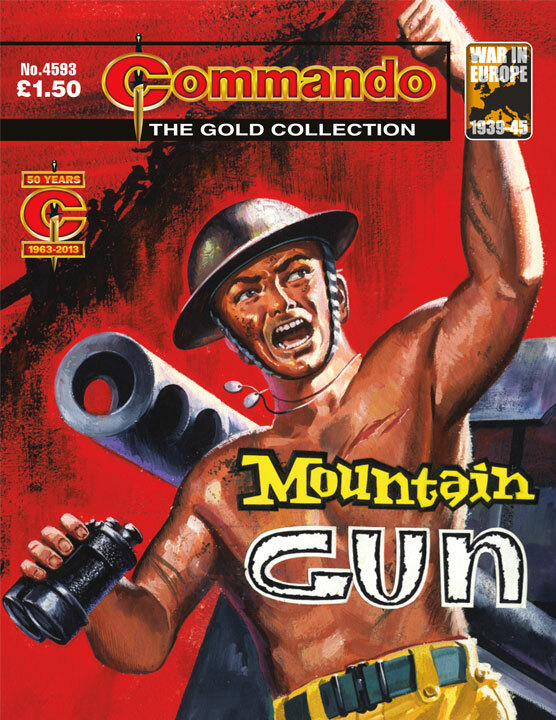 “What makes a perfect Commando? That question is often posed, but can never be answered,” notes editor Calum Laird of this re-presented tale. “There is no magic formula. This story, from the sure pen of Eric Hebden, does have many of the ingredients, though. 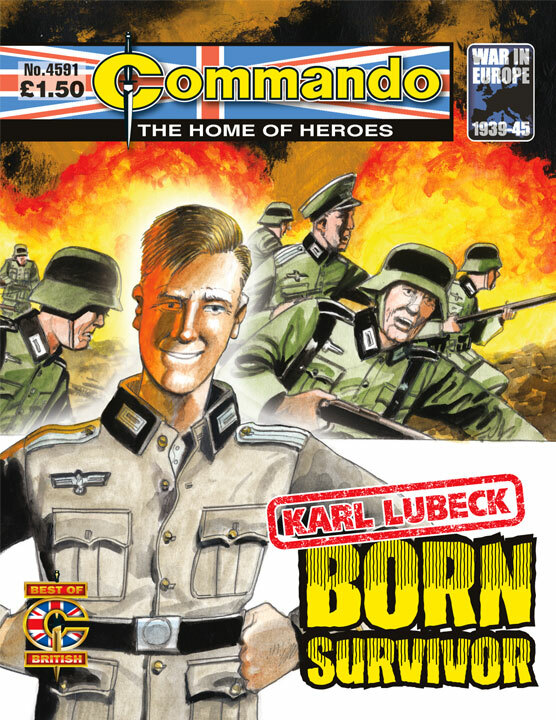 A young officer at odds with a veteran NCO, a vital but nigh-impossible mission - ideal Commando fare. At top speed the four British jeeps raced across the sand. Travelling by day was risky but these desert raiders had vital information that had to be relayed at all costs. Then three Me109 fighters pounced, unleashing a vicious hail of bullets. The leading jeep took a burst, exploding violently. Two more were quick to suffer the same fate. “A ticking clock - albeit here a metaphorical one - is a good story-telling device, immediately heightening tension and drama,” feels Deputy Editor Scott Montgomery. “Here our desert raider heroes must get vital gen about a target back to HQ but are up against the odds at every turn. *Saving based on discounted Direct Debit price compared with shop price. First quarterly payment discounted by 50% at £12.50 and £25 per quarter thereafter. UK bank accounts only. One year discounted subscription rate of £99. Aces Weekly, published by David Lloyd, stuffed with creator-owned strips is now running its first week of the fourth collection of their great, exclusively digital, online comic art series which is appropriately called - Aces Weekly Volume Four! "It's our biggest volume yet," says David, "and with an extraordinary mix that I hope readers are all enjoying." 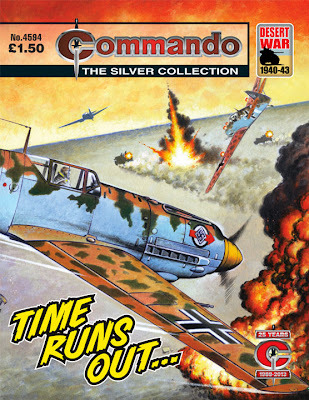 This Volume - which runs forseven weeks of seven issues - contains the excellent Phoenix by Jimmy Hoxton and Guy Adams; Firehawks by the legendary Herb Trimpe; Dark Utopia by Mark Montague; and Just Force by Stephen Baskerville, amongst other beautifully-crafted pieces of the dramatic and the comedic. 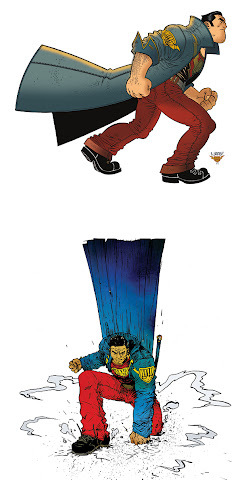 "Phoenix is the second of our contributions thus far in Aces Weekly to explore some of the possibilities of digital storytelling outside of venturing into the dismal areas of ' motion comics'", David enthuses. "What Jimmy and Guy have done with Phoenix in this volume is what Mark Wheatley and Jeff Vaughan have done in our previous volumes with Return of the Human (which is returning soon...) - i.e. use the advantage of unlimited, non-printed-page-restricted space to show the growth of a concept rather than playing with rudimentary technical trickery to elaborate and decorate! "We are very proud and very pleased to present the inventiveness and creativity of these excellent creators, and wish our readers great fun in seeing it all develop in front of your eyes as time passes over our period of running these excellent works. "Aces Weekly continues to reach out into the world," David reveals. "I just came back from a trip to a comics show in Italy last weekend where the response to what we're doing in this new world of publishing on the net was warm and welcoming despite the fact that it came from an audience that was accustomed to a market of healthy and regular newstand print sales. "Each country I visit on the quest to spread the message of what we're doing with Aces Weekly has its own history and customs, but not one of them is less than a welcoming. Some are more open to the new than others, but none are rejecting. And every one of them recognizes that what we are representing with Aces Weekly is the future. I am glad to be a part of it (despite all the hard work attached to it...)"
Print Media's STRIP: The Adventure Comics Magazine, an all-ages British adventure anthology comic, is now on sale in selected UK high street newsagents (and available to order from any newsagent). The title will be on sale in UK comic shops from next week and is already available digitally for iPad. The new comic – inspired by the great adventure comics of Britain’s comics past such as Eagle, Valiant and Lion - features some great art and stories from some brilliant creators including John McCrea (Hitman, The Boys), Smuzz (2000AD), John Freeman (Doctor Who), Milo Horvatic (Marvel) and Richmond Clements (Renegade) - plus comics news and interviews and other features. The move to Britain’s high street is the latest stage of publisher Ivo Milicevic's desire to bring the anthology to a wider audience in the UK, in addition to its continued sale in comic shops and as a digital edition for iPad, in association with ROK Comics. 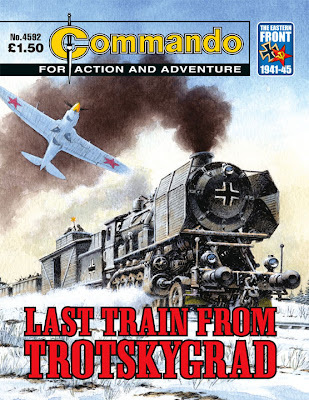 Headed up by long time comic creator Ivo Milicevic, Bosnian-based comics publisher Print Media began the long road to bringing a British version of their action adventure anthology to the UK back in February 2010, after their re-publication of Dan Dare from the 1950s comic Eagle drew the attention of comics fans. Print Media publishes three comics-related magazines in Bosnia, including Strip Magazin and a localized edition of Metal Hurlant. 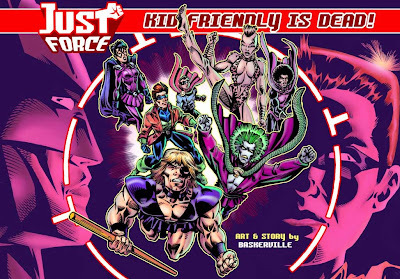 Mr Milicevic began to investigate the possibility of bring his STRIP brand to the UK, horrified to discover the British comic characters he had grown up reading such as Steel Claw, the Spider and Black Archer were nothing but distant memory. Although these incredible heroes had been re-published in the former Yugoslavia and indelibly helped shape his life-long love of comics, the British titles that spawned them - weekly comics like Lion and Valiant - were long gone from the news stand, replaced largely with licensed fare and more magazine-based titles for teenagers. Unimpressed, he decided to take the plunge and trial a new action adventure anthology through UK comic shops. 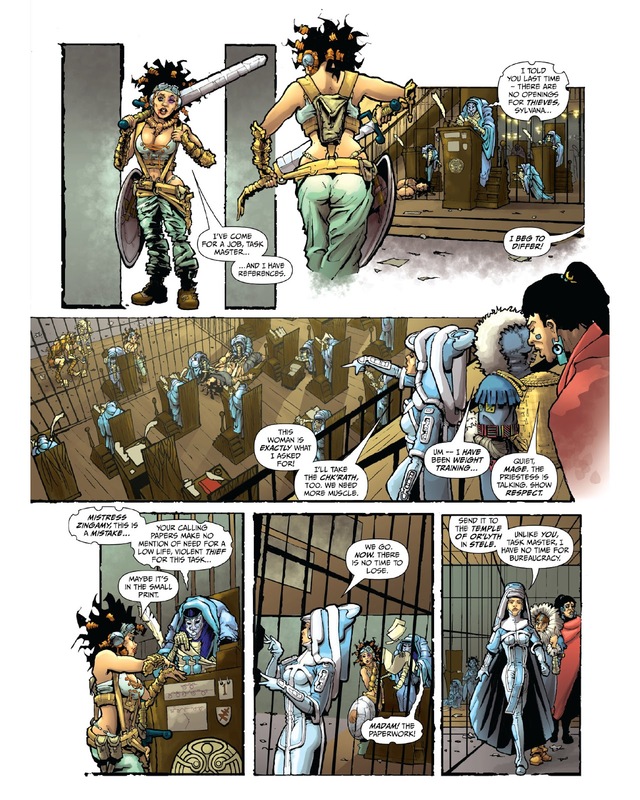 The first volume of STRIP was intended to road test the title and story ideas - and iron out any issues arising from its long distance publishing. Although Mr Milicevic freely admits the journey has not been easy at times, with the support of some of Britain's best and brightest comic creators those first seven issues got the positive reaction he was hoping for. The response made him all the more determined to join the likes of 2000AD, Commando and The Beano in WH Smiths and other select newsagents. Offering a mix of action adventure, science fiction and fantasy strips, stories in the pipeline include Dragonrir, a stunning fantasy tale by Miljenko Horvatic and Damir Zitko; a thrilling story of the criminal underworld, Deliverer, by Miljenko Horvatic, drawn by Bernard Kolle; WarWorldz by Stephen Walsh and Giancarlo Caracuzzo; the tale of an ancient warrior battling magic, Thracius, by James Hudnall and Mark Vigoroux; plus the return of other strips, including Age of Heroes by James Hudnall and John Ridgway and The Devil’s Heritage by Jerome Felix and Paul Gastine. "I am really excited our plans for STRIP Magazine are finally developing as I planned three years ago" says publisher Ivo Milicevic. "There is no certain formula for success, but the Magazine will have some good stories and really great art." • KING COBRA (written by John Freeman, art by Wamberto Nicomedes) A classic British hero resurfaces when the Bank of England is robbed! • BLACK OPS EXTREME (written by Richmond Clements, art from Stephen Downey) The anti-terrorist team head for Eastern Europe when a nuclear power station is raided! • WARPAINT (by Phil Hester and John McCrea) Re-told from the very beginning - one teenager's deadly battle with ancient forces! 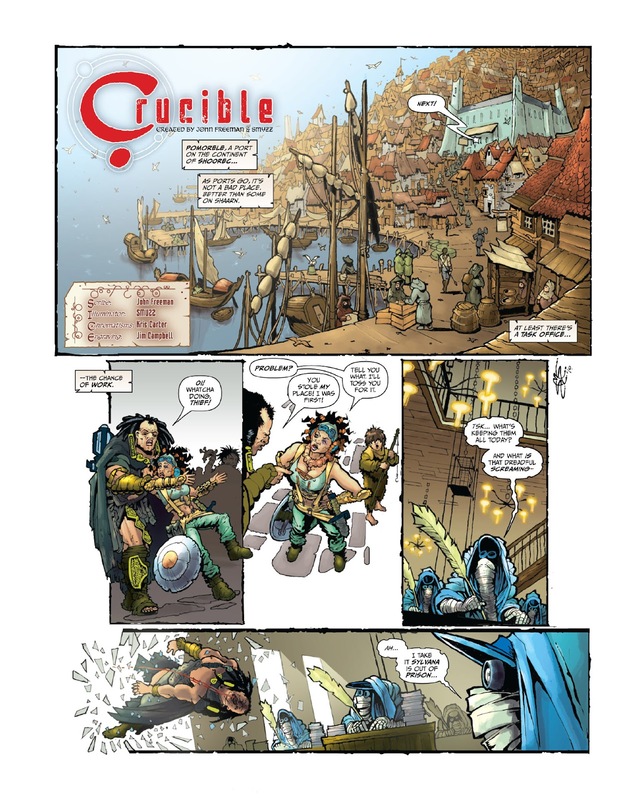 • CRUCIBLE (by John Freeman and Smuzz) A deadly task for a mis-matched team of adventurers - in a world where not everything is as it seems! • OPERATION INFERNO (by Richmond Clements and Nick Dyer) Steampunk spies battle to defence the British Empire! Here are two pages of the the first episode of Crucible, which features in the relaunched STRIP Magazine #1, out this week. The strip is written by me, with art by Smuzz, colour by Kris Carter, lettered by the wonderful Jim Campbell. As some long-suffering readers of this blog know, the story is based on a concept I’ve had in my head for years but I never wanted it to be sold to a company and Smuzz was the artist most connected with it down the years. (We almost got it picked up by Marvel’s Epic brand, thanks to Dan Chichester, just to give you an idea of how long this one has been in the works! Grateful thanks to everyone who has supported this project along the way, especially Smuzz. This is one of the mag’s creator owned strips, which also included Phil Hester and John McCrea’s Warpaint on that front. The print version of the Magazine should be on sale from today (Thursday) in selected WH Smiths although getting a straight answer out of them as to the exact release date has been a struggle, causing a bit of disappointment for the title's (currently) small but fervent fan base: it will certainly will be be on sale, I’m told, in the London area today with full roll out tomorrow. There’s a full list of WH Smiths that will be stocking it on the STRIP blog (http://stripcomicmagazineuk.blogspot.co.uk/2013/04/strip-magazine-1-wh-smiths-store-list.html). It’s also available to order from any WH Smiths or newsagent in the UK, heading for UK comic ships via Diamond and you can definitely buy it for iPad now (https://itunes.apple.com/app/strip-magazine-2.1/id619259147. 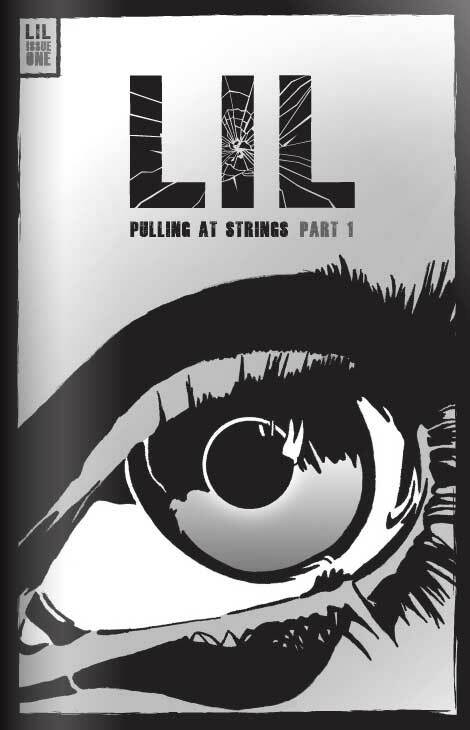 Michael Young and Marc Crane, a creative team from Billericay in Essex, have just released a collection of their comic LIL, which they've been publishing online for quite a while. 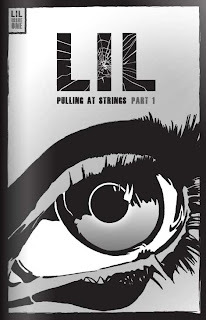 LIL is a gritty, noir-based comic series set in a fictional state somewhere along the gulf of Mexico. The story unfolds through the eyes of an edgy female prognostic, who is down on her luck when she happens upon mysterious bag. "We've produced five issues at present and we're now working on Issue six," Michael tells us. "You can read the full comic so far on our website (www.lilcomic.co.uk). "We've recently produced a print collection of all five issues, which is currently selling in the Leicester square comic shop: Orbital, as well as on our website." "We've recently received some amazing support and praise locally," reveals Michael, "and reviews and interviews internationally on an American podcast show, Pod Magnetic. We've featured in a nationwide online magazine and been favourably reviewed by a well respected blogger with in the noir genre. "We're hoping to making LIL into a long running series." Brilliant photographer Steve Cook, whose design credits include Doctor Who Magazine and 2000AD as well as projects such as Alternity with Shaky Kane and whose 2009 Secret Origins exhibition of many British comic creators remains a superb snapshot of the industry, has just announced he will be exhibiting a series of previously unseen photographs of the Doctor's much-loved sidekick Ace, Sophie Aldred, at the Orbital Comics Gallery in London from 5th - 30th September 2013. Sophie will be making an appearance and signing too. 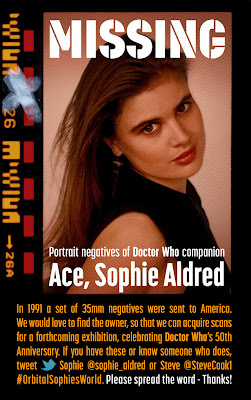 I commissioned Steve for several photo shoots while I was editing Doctor Who Magazine, and he went on to snap several photo sessions with Sophie and other Who stars – but, sadly, one set of negatives remains missing. Knockabout will be publishing an English language edition of Wilfrid Lupano and Jérémie Moreau's Le Singe de Hartlepool in September, telling the story of the legendary Hartlepool monkey, allegedly hung by townsfolk fearing it was a French spy during the Napoleonic wars. Published in French by Delcort, Le Singe de Hartlepool (available in French from amazon.co.uk) is the first collaboration Lupano and Moreau and had a high profile during this year's Angouleme Festival. 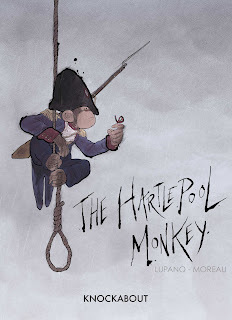 "The story of the monkey hung by the citizens of Hartlepool as a French spy in the Napoleonic Wars is well known," notes one of Knockabout's regular contributors, Hunt Emerson, who drew our attention to the story. "The comic book tells it with graphic brilliance and humour." 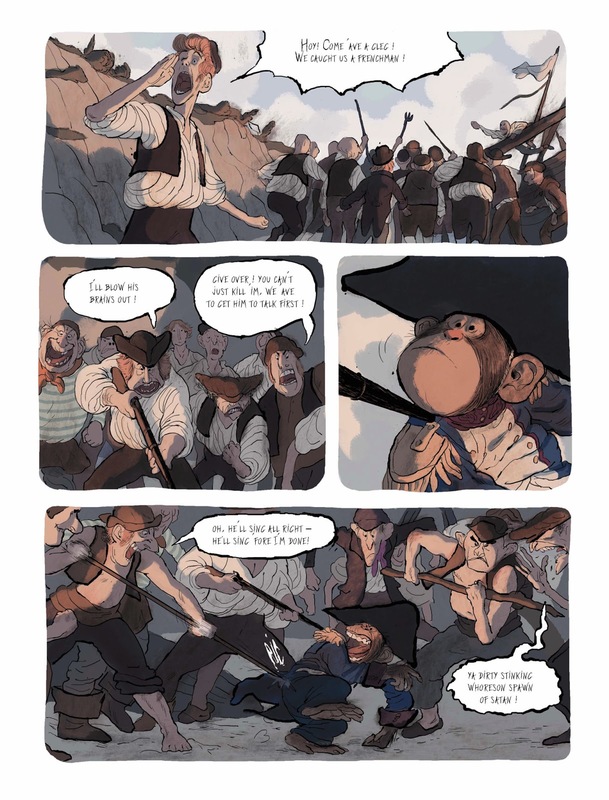 bdgest (in French) notes its writer, Wilfrid Lupano, overheard the story in a Manchester pub and has turned the anecdote into a fabulous comic, with the monkey's story becoming a universal tale denouncing the narrow-mindedness and stupidity. While the story is funny on the surface, there's a darkness to the underlying theme. According to local Hartlepool folklore, during the Napoleonic wars a French ship was wrecked off the coast of Hartlepool. The only survivor was a monkey, allegedly wearing a French uniform to provide amusement for the crew. On finding it, some locals decided to hold an impromptu trial in the town square; since the monkey was unable to answer their questions, and many locals were unaware of what a Frenchman may look like, they concluded that the monkey was in fact a French sailor. Just to make sure, the animal was thus sentenced to death and hanged in the town square on the Headland. Le Singe de Hartlepool has already drawn the attention of Hartlepool residents. “I had a good read of it and it’s a really good laugh," says Hartlepool restaurateur Krimo Bouabda, who received a copy from his friend Didier Deville, who was also a well-known chef and restaurateur in the town from 1986. “The pictures are amazing," he told the Hartlepool Mail. "You can see the Headland, the Fish Sands, the Town Wall and St Hilda’s Church, it’s a beautifully-drawn cartoon. The story also mentions Hartlepool Mayor and former H’Angus the Hartlepool football monkey mascot Stuart Drummond. “The whole thing is really funny, it makes the French monkey out as the victim,” said Krimo. “I do hope they use a bit of the Hartlepool lingo when it gets translated." Jeremie Moreau apparently plans to pay a visit to Hartlepool on the book's release. Let's hope he gets a better reception than the monkey did! 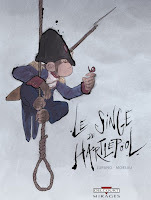 • Here's a video (in French) of Le Singe de Hartlepool's promotion at Angouleme. Dirk van Dom has dropped us a line to tell us that the latest issue of action adventure indie anthology Vanguard is now on sale. "It's been a bit of a wait as myself and my fellow creators fended off various zombie-like RLI's ("Real Life Issues") that just wouldn't curl up and die," he says, " but our third edition is finally here! And it's worth the wait, if I do say so myself. 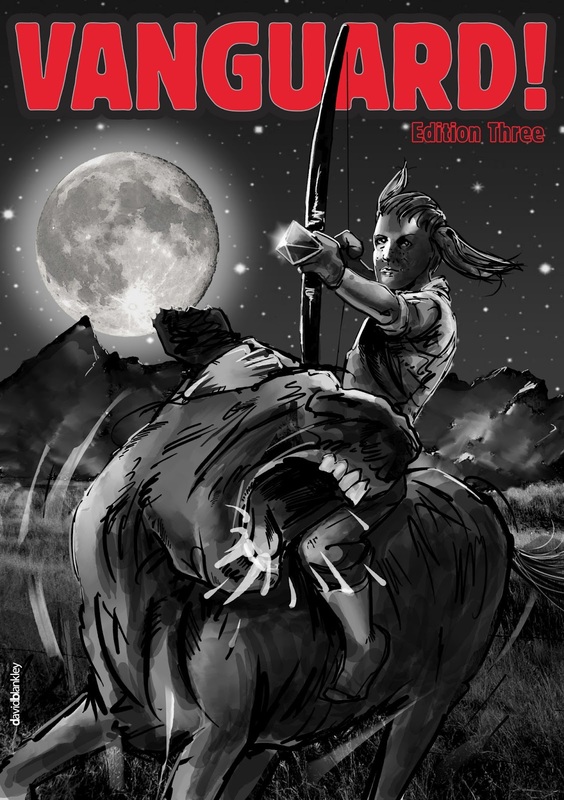 Wrapped in a cover featuring Duncan and Jamie of 'Mammoth Jack', with art by David Blankley the 32-page anthology includes continuations of three established stories ('Atomic Call', 'Mammoth Jack' and 'Tucker') with three new tales joining the mix - 'Vestige', 'Harry Kane' and 'S.N.A'. "Notable amongst these is S.N.A, which appears - and will continue to appear henceforth - as a blood-soaked full colour centre-spread strip," says Dirk. "The one bit of bad news is that, due to circumstances beyond our control, chapter 3 of 'Halo and the Gryphon' will not appear as scheduled. But it will return, with a vengeance! Mammoth Jack (Art: El Chivo): Jamie Swift's one-girl (and her donkey) attack on industrial kingpin Gobbett delivers dire consequences when he discovers where she's hiding and sends a team of brutal ruffians to 'take care of business'. Vestige (Art: Brian Coyle): Irish-American Chet Easterbrook travels to Ireland following a series of tragic events that lead to his life being turned upside-down and inside-out. He feels certain he will find answers to his predicament here...but his predicament is about to get worse. Harry Kane will see Her Safely Home (Art: Jim Cameron): This light-hearted adventure strip follows MMA Champ and B-movie action star Harry Kane, who - following a chance encounter with a strange old man whilst touring Tokyo with his new movie - inexplicably finds himself hundreds of years in the past, seemingly living out the plot of his film! • Vanguard Issue 3 is available directly from Dirk Van Dom at a cost of 2.50 euro + P&P. (P&P = 1.50 euro ROI and NI, 3.30 euro UK and abroad). Order via paypal: vanguardcomic@gmail.com. If ordered from Dirk, the issue will ship with a free set of full colour artcards featuring some of Vanguard's characters in a Japanese themed setting. Check out previous blog posts for a look at the cards. (Of course, they look even better in the (paper) 'flesh'. :) Only a limited number have been printed, so it's a case of first come, first served with these.